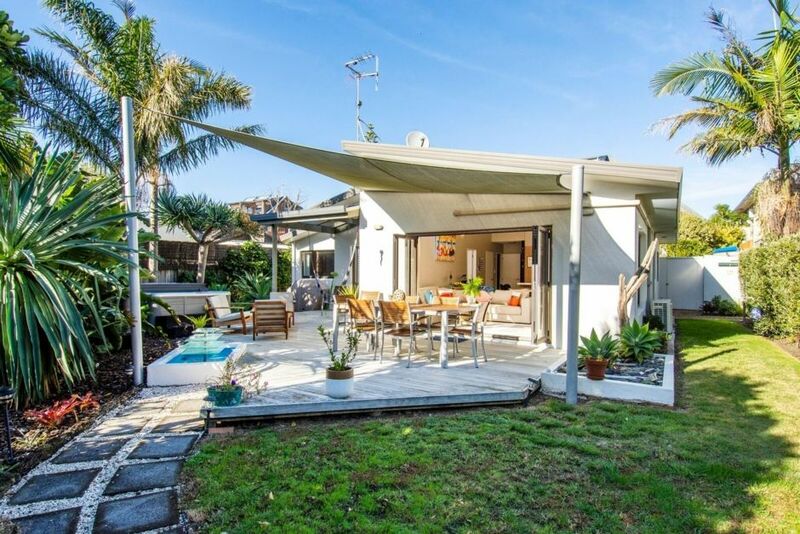 This is a modern single level comfortable beach house, across the road from Papamoa Beach, one of the best beaches in NZ. Care has been taken to ensure Soulhaven has everything needed to ensure guests have a restful, happy, comfortable stay through the decor, high quality beds and linen, bikes, boards, deck chairs, games, toys etc. Soul Haven has an easy open plan indoor outdoor flow, with fully opening sliding doors leading to a large deck for outdoor dining, complete with a tropical garden, water feature, BBQ and a hot spa pool sitting under gorgeous outdoor lighting and palms. The deck has an 8 seater table and chairs plus another area with an outdoor lounge set to seat 4 people. The property is set in a mature seaside neighbourhood. Within easy walking distance are; restaurant and bar, takeaways, medical centre, physio, chemist, cafe, mechanic, liquor shop, hairdresser, dairies and an eclectic second hand shop - full of treasures. Soulhaven best suits extended families, families and couples wanting a peaceful break away. There is a regular bus service on Papamoa Beach Road, there is a bus stop within 50 metres of the property. Fashion Island and Papamoa Plaza are 5 kms away. Bayfair Shopping centre is 10 kms away. Whakatane, Rotorua and Hamilton are all an easy day trip from Papamoa. Our expectation is the person who books the property must stay for the duration of the nights booked unless by prior arrangement. Discounts apply to long stays beyond one week. House is off the main road, quiet and private. Bikes are available on request as are a portacot with linen, highchair and baby bath (at no cost extra cost) . Kids toy box and games for children and adults. Children need to be well supervised due to the water feature and the spa pool. A compulsory $75 cleaning fee applies. Off street parking for 2 cars only tandem. No room for boats or trailers sorry. Preferance given to family groups or small groups with a positive Bookabach history. Passport or Drivers licence ID may be required. Beautiful fresh linen of the highest quality . All beds have electric blankets from June through to October. 2 cars tandem. Off street parking. not suitable for a boat. Fully equiped with new stylish comfortable furniture New television with Freeview. suitable for children and adults includes helmets and tire pump - LOL. Well presented and perfectly set up property for small groups with kids. Beach, toys, spa. Sorted! Really enjoyed our experience here. Two couples with one child each, found the accommodation flexible with plenty of shared space in the communal areas. All of your other adult whims catered for, will definitely be back! Lovely and Well equipped property. The host is very friendly. Highly recommend. Clean, relaxing, great location and property. Will go back again. we were very satisfied with both the house and the garden. You were great guests. Thanks for leaving everything so clean and tidy. Maybe see you again.